Houston pulled off an amazing comeback versus LSU on Wednesday night to stay undefeated. 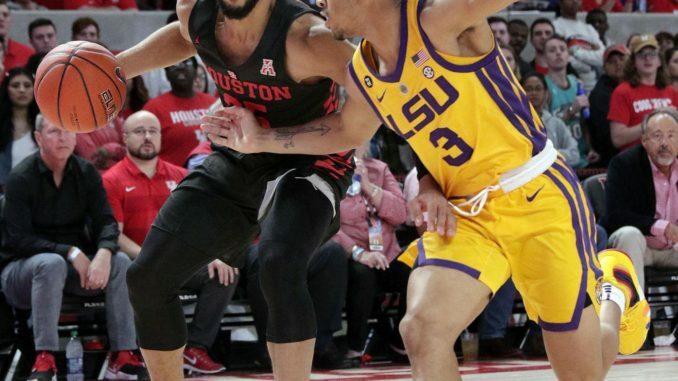 While Houston hasn’t had any prospects jump out this season, LSU has two draftable prospects in point guard Tremont Waters and power forward Naz Reid. Tremont Waters finished the game with just 10 points, 2 assists, 2 rebounds, 3 steals, and 5 turnovers on 3/13 shooting, including 1/9 from 3. While the stats were not the strongest, his playmaking still had some highlights. Naz Reid recorded 13 points, 4 rebounds, 1 assist, and 3 turnovers on 4/8 shooting (0/3 from 3). He displayed good ball handling and good defensive habits throughout the night. While Reid is not a great defender on most nights, he was sufficient versus Houston. In the first three plays, Waters shows his elite vision and ability to pass over a defense despite being undersized. In his freshman year, he continually made reads in transition over the defense in order to speed up the offense and find the cutter. As shown in the first play, Waters is able to perfectly track where his teammates are at all times. He places mental markers on his teammates, which help him make spectacular reads. In the third play, he is drawing defenders in by moving around and crossing up defenders. While most collegiate point guards would have gotten carried away in the pressure and not losing the ball, Waters is still using his peripheral vision to see Darius Days cutting for the easy alley-oop. Considering the amount of help defense on drives in the NBA, Waters should thrive as a playmaker at the next level. In the fourth play, Waters simply assist hunts. Waters has a numbers advantage and likely could have drawn a foul by attacking the defender, he decides to be too unselfish, which results in a turnover. Moving onto Naz Reid, we see his guard skills on display in these two clips. In the first clip, he shows his shiftiness and his tight handle with a hint of explosion after the whistle. In the second clip, it’s more of the same, but against more adversity. First, he uses him pump fake quickly to his advantage, followed by a great move to avoid the defender by staying left and not losing the handle. Once he gets past the 2nd defender, he makes a great read by taking advantage of the out of place defender (#23) down low to find a cutting Emmitt Williams. Unfortunately there was no assist recorded on this play due to the block, but that shouldn’t take away the great play from Reid. Overall, this game was neutral for Tremont Waters despite a negative statistical performance. He needs to improve his turnover rate and shot selection. His playmaking, shooting, and understanding of the game will almost guarantee he gets a chance in the NBA. Naz Reid has been fighting inconsistencies since starting hot in the first few games. His shooting percentages have not caught up to the talent yet. In his first three games, Reid was 6/14 from three point range. Since then, he is 4/17. Reid has good form on his jump shot and has extended range for a freshman power forward. In order to solidify a lottery selection, Reid must have a strong SEC performance starting in a couple of weeks.